The fact that a population of 18,000 inhabitants includes 12.000 brothers, 9 brotherhoods and 29 processional paces gives an idea of the great importance of Easter in Daimiel. Characteristic of its celebration is the sequence of its processional parades, which are organized following the strict order of Jesus Christ Passion. And also the colorful cloaks, cowls and hoods the brothers wear, from which their popular nicknames come from:coloraos, capuchinos, moraos, blancos, negrosandcorbatos. Significant is the Stations of the Cross organized for this day by Pasión Arch-confraternity as it is held at night and carrying torches that light up the stations of the 5 kilometers long itinerary. On Palm Sunday at 11.30 in the morning the children procession known as "La Borriquilla" (the small donkey) takes place. Although the child section of Santísimo Cristo de la Columna y María Santísima de la Amargura brotherhood are the ones that parade, all the children in Daimiel are invited to take part. As well as the pace, the girls dressed like Samarians and carrying amphoras are also a characteristic of this procession. On Holy Sunday most of the brothers go to the Christ descend ceremony at Santa María church. The image is taken down from the wall emulating the centenary tradition of descents from the cross with articulated images dating back to the 16thcentury. 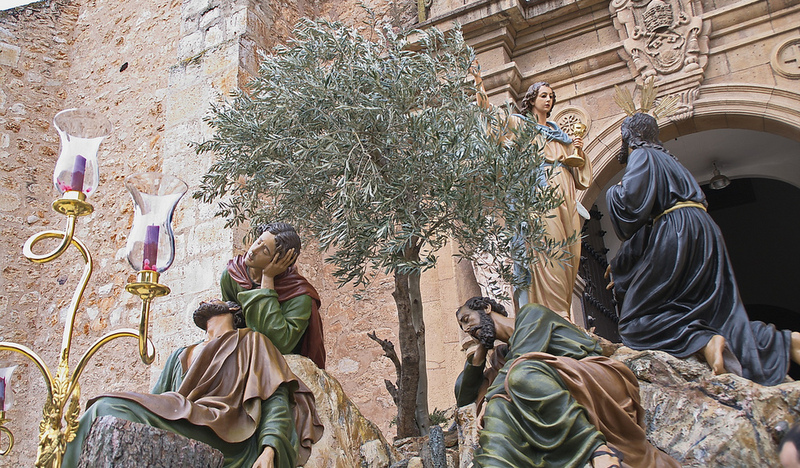 On Holy Tuesday, the replicas of the original paintings at the Cristo de la Luz Hermitage are distributed around the city to form the stations of the cross. The almost 600 brothers of the Pasión Arch-confraternity, wearing black tunic and cowl, go along with the Santísimo Cristo de la Luz around Daimiel at night. On Holy Wednesday (Spy Wednesday) at night the procession depicting Christ dead at the cross, called Santísimo Cristo del Consuelo, goes out escorted by the image of the four evangelists and carried by the brothers of Real e Ilustre Hermandad Sacramental del Santísimo Cristo del Consuelo brotherhood. Significant is the Santísimo Cristo de la Columna y Nuestra Señora de la Amargura brotherhood, founded in 1575, which makes it one of the oldest in Campo de Calatrava. Its five paces go out on Holy Thursday: the Holy Supper, Prayer in the Garden, Our Lord Captive Jesus, the Most Holy Column Christ and Holy Mary of Sadness. 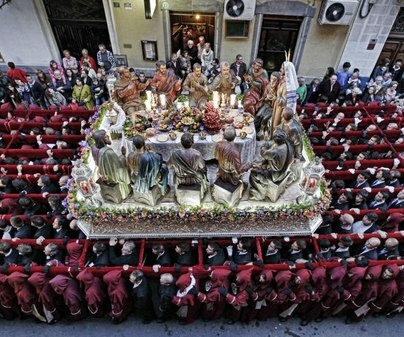 Nuestro Padre Jesús Nazareno Brotherhood, nowadays made up of more than 5,000 brothers, is one of the biggest in Spain. Good Friday procession is made up of 8 paces carried by Nazarenes dressed in purple cloak and hood with crown of thorns. The brothers also carry a black cross on their left shoulder; on it, the different scenes, such as the meeting between Jesus with the Virgin and Christ with the Veronica, are depicted. The Santísimo Cristo de la Columna y María Santísima de la Amargura brotherhood wears white tunic and purple cloak. 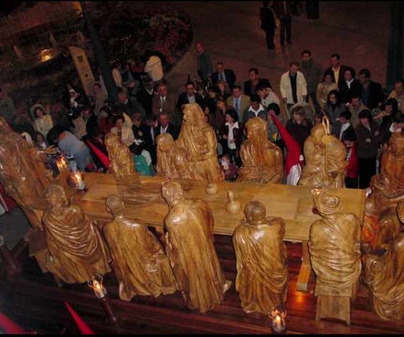 Its procession is made up of five paces, among them Cristo de la Expiración, the only baroque image which was not destroyed during the Spanish Civil War. The accompanying music stands out because of the marches they have created for the Brotherhood. 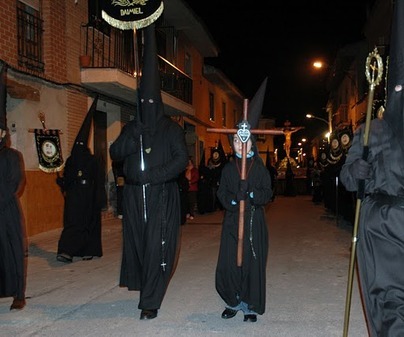 The Nazarenes from the Santísimo Cristo del Sepulcro Brotherhood wear black tunic and Hood and carry a large candle during the procession on Friday night. To its two Christ images one on his mother arms and another one at the sepulcher, the Jesus image of the Santísimo Cristo del Consuelo brotherhood joins along so that the three images, all by the sculptor Castillo Lastrucci, are displayed together. 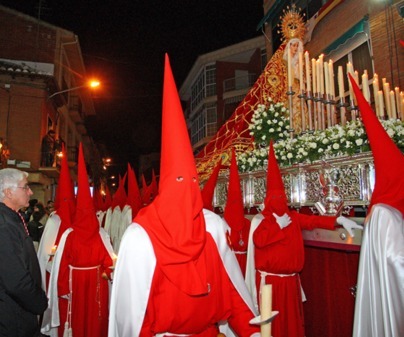 The tunic of the penitents from the María Desolada Reina de los Mártires brotherhood is black with a red Calatrava cross in their chest and a pilgrim staff. 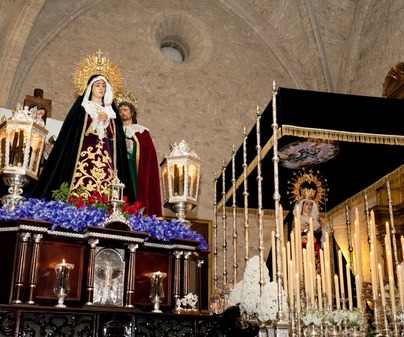 It goes out on procession at night carrying María Desolada and Cristo de la Buena Muerte images, along with 7 heavy penitential crosses depicting the Seven Pains of the Virgin. 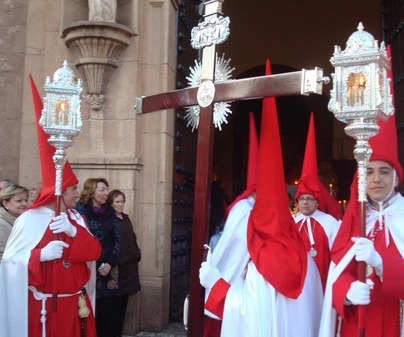 Easter in Daimiel is a festivity that keeps growing culturally and, as a result, the Resurrected Jesus procession has been retrieved, organized by the María Desolada Brotherhood. Movable date: From Spy Wednesday to Easter Sunday. 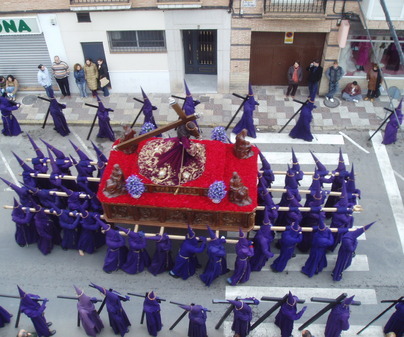 We recommend you to contact Daimiel Tourist Office for times and itineraries of the processions at Tablas Road, km. 10, Phone no. (+34) 926 260 639. Opening hours: everyday from 10 to 14 h. and from 16 to 18 h. except Mondays and Sundays in the afternoon.